April 23, 2017: it was a grey, overcast day. The rain, after going through multiple changes of pace, had finally settled down to a gentle drizzle. In other words, it was a typical day in Seattle. At the Crossroads Park in Bellevue, the atmosphere was anything but gloomy. About 60-70 souls, disregarding the weather in true Northwest spirit, had gathered together for a March for Unity. Children, women and men, dressed in everything from outdoor gear to hijabs to overcoats to police uniforms, had all come together to show that what is common in all of us is much larger than what divides us. 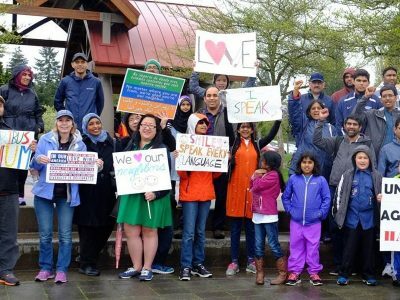 Originally conceived by AID Seattle volunteers Murthy Gorty, Sripriya Natarajan, Prashant Nema and Priya Raghav in the wake of the torching of the Bellevue Mosque in January, the march became a way for people from diverse backgrounds to mingle together and recognize their mutual humanity. After weeks of effort on their part, it grew into something much larger with the involvement of other local organizations. Groups like the Eastside Refugee and Immigrant Coalition, local mosques and churches got involved and interested. It grew from being a plan for a single event to a network of like minded groups, all interested in knowing “the other” and being known by them. A Facebook page Network for Unity was created to keep this community together and build on the relationships that were forged. The march started with a set of small speeches by the representatives of the various organizations represented in the park. Murthy Gorthy related an incident involving a friend who told him that he was afraid to go out with his family, and that it had been ages since he went to the Bellevue Square mall simply because he was Muslim. That motivated him to do something public to combat the fear of the other and build confidence among people who may stand out because of their appearance, accent or life choices. 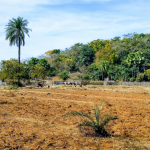 As AID-India volunteers, we have long talked about being active in the community we live in. There is no better time like this, there is no bigger cause than this in the current atmosphere. Let’s start with a Solidarity March on the Eastside, the area where a mosque was burned down recently. I will lead this effort from AID Seattle. In many ways, the past five months have reduced our country to a nation of people defined by our differences: those who are for and those who are against, conservatives and liberals, white and brown, Muslim and Christian, documented and undocumented. In that light we are one-dimensional versions of ourselves. In that light, we are distorted and diminished. In that light, we are divided. Today is about casting a new light. Bellevue Police Department Captain Popochok came forward to welcome the gathering and expressed the commitment of his department towards strong community relations that would build trust and reduce fear of the other. We then started together on the march. 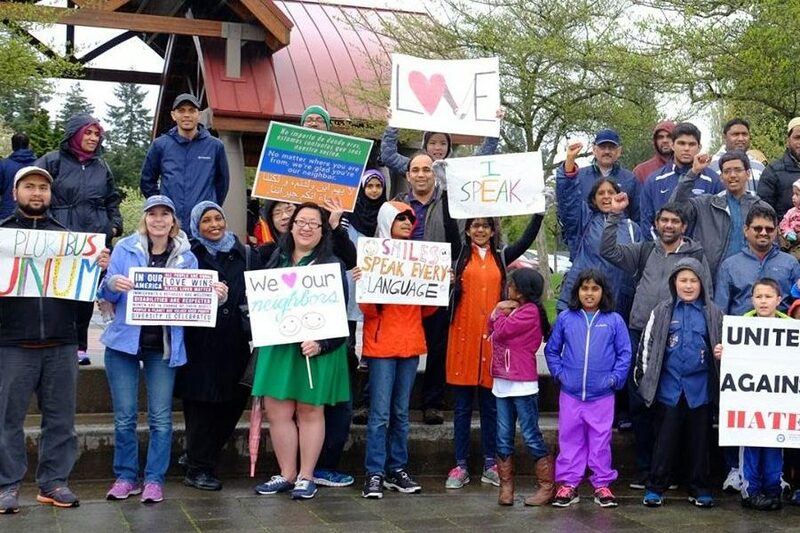 Holding a variety of banners with messages as diverse as the group itself, we talked along the sidewalk near the Crossroads shopping mall in Bellevue, waving to people. Some of the cars driving by honked in support. When we came back to Crossroads park, people related anecdotes and promised to meet again and keep this effort going. With all of the divisiveness and hate that is around in the air today, I believe it is important to look within ourselves and our communities to see what we can do to change things at a personal and local level. 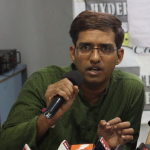 Even in an organization as committed to diversity as AID, I do not believe that the composition of our organization reflects the diversity of India. This march is a small step in the right direction. Amit Ghosh, a product manager, volunteers for AID in Seattle. He attended the march along with his daughter Sachita.